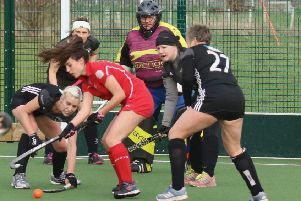 A youthful Garstang Hockey Club second team drew 1-1 with a much more experienced Lancaster University firsts in awful weather. In a very competitive first half Garstang took a deserved lead from a well-worked goal from open play, scored by 15-year-old Caitlin Ball, just before the half-time break. The second half saw Garstang take control of the game in every aspect but they were unable get what would have been the decisive second goal to finish the game off. This allowed the University to profit from a questionable umpiring decision to gain an equalising goal. Despite further efforts Garstang were unable to get the winner on the back of a very good team performance. It means they are now in equal third spot in the Premier Division despite the loss of players to support the first XI. Elsewhere, the firsts went to Northern in Liverpool and won 7-2 to avenge their one defeat in the first game of the season in style. The thirds fought hard and successfully to earn a 1-1 draw at home against a strong Lancaster Nomads side. The fourths lost 3-0 at Leyland and Chorley but held the home side in the second half to keep a clean sheet. The match was the first full game for 13-year-old goalkeeper Niyah Johnston, who did very well, while there was an excellent performance in defence by Mags Crofts.